Everyone has seen a Bloomin’ Onion before, but what happens when you kick it up another notch? 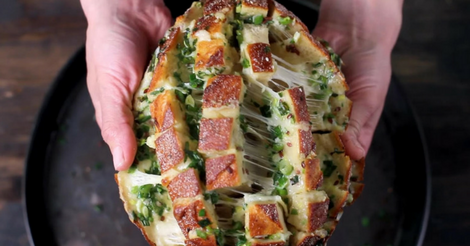 You get Bloomin’ Onion Bread! Do you love warm garlic bread? Do you love melted, gooey cheese? Ok, you need to try this then! Here’s the video and the full recipe is written below, so no need to take notes! 1. Preheat your oven to 350 degrees and line your baking sheet with foil. 2. Cut your bread to make a grid horizontally and vertically, but do NOT cut all the way through to the bottom! You want the loaf of bread to remain one large loaf. 3. Mix together the butter, green onions, garlic powder and sesame seeds / flax seeds. Garlic powder is totally optional, but really gives it a yummy garlic bread flavor. 4. Place the slices of cheese into the cuts in the bread. 5. Carefully pour the butter mixture into the cuts in the bread. It may be helpful to use a spoon to get in all of the cracks! 6. Cover the entire loaf with foil and place it in the oven. 7. Bake for 15 minutes. Then, take the foil off and bake for another 10 minutes. Enjoy the melted, gooey cheese goodness!!! Make sure you save this on Pinterest and share it with your friends on Facebook! And don’t forget to like Encapo on Facebook and Pinterest, so that you never miss a recipe!